This class provides a simpler interface to the functionality offered by the DataPostprocessor class in case one wants to compute only a single vector quantity (defined as having exactly dim components) from the finite element field passed to the DataOut class. For this particular case, it is clear what the returned value of DataPostprocessor::get_data_component_interpretation() should be and we pass the values returned by get_names() and get_needed_update_flags() to the constructor so that derived classes do not have to implement these functions by hand. All derived classes have to do is implement a constructor and overload either DataPostprocessor::evaluate_scalar_field() or DataPostprocessor::evaluate_vector_field(). An example of how the closely related class DataPostprocessorScalar is used can be found in step-29. An example of how the DataPostprocessorTensor class can be used is found in the documentation of that class. In the second image, the background color corresponds to the magnitude of the gradient vector and the vector glyphs to the gradient itself. It may be surprising at first to see that from each vertex, multiple vectors originate, going in different directions. 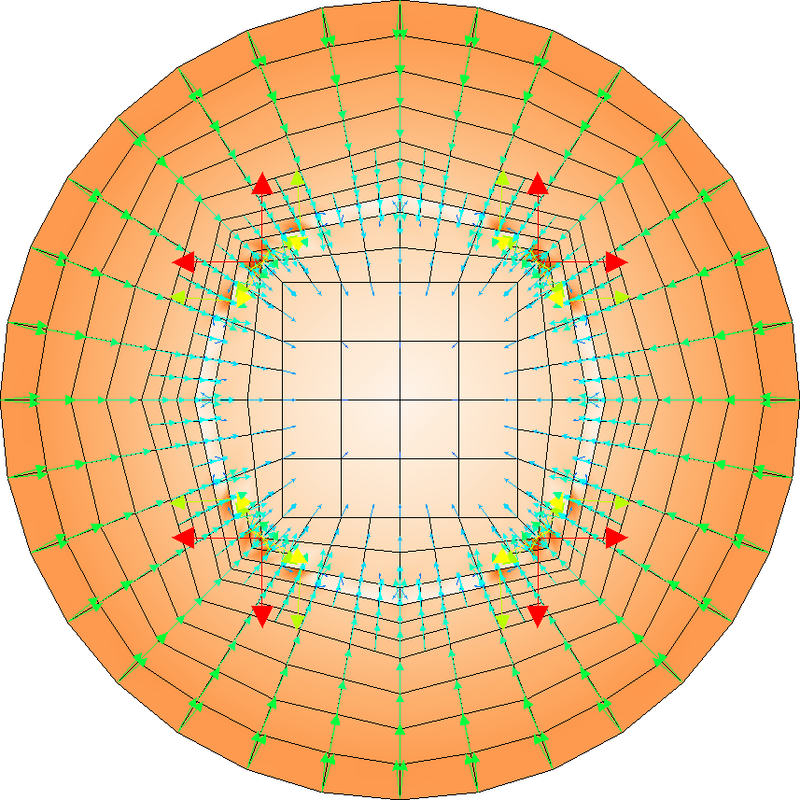 But that is because the solution is only continuous: in general, the gradient is discontinuous across edges, and so the multiple vectors originating from each vertex simply represent the differing gradients of the solution at each adjacent cell. As the background color shows, the gradient times the coefficient is now a continuous function. 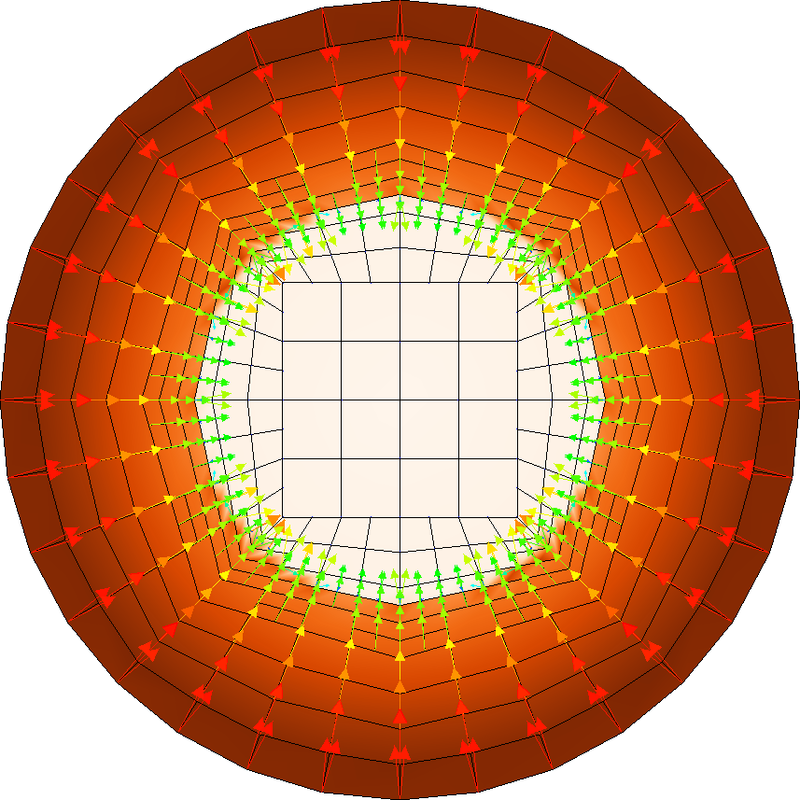 There are (large) vectors around the interface where the coefficient jumps (at half the distance between the center of the disk to the perimeter) that seem to point in the wrong direction; this is an artifact of the fact that the solution has a discontinuous gradient at these points and that the numerical solution on the current grid does not adequately resolve this interface. This, however, is not important to the current discussion. The example above uses a scalar solution and its gradient as an example. 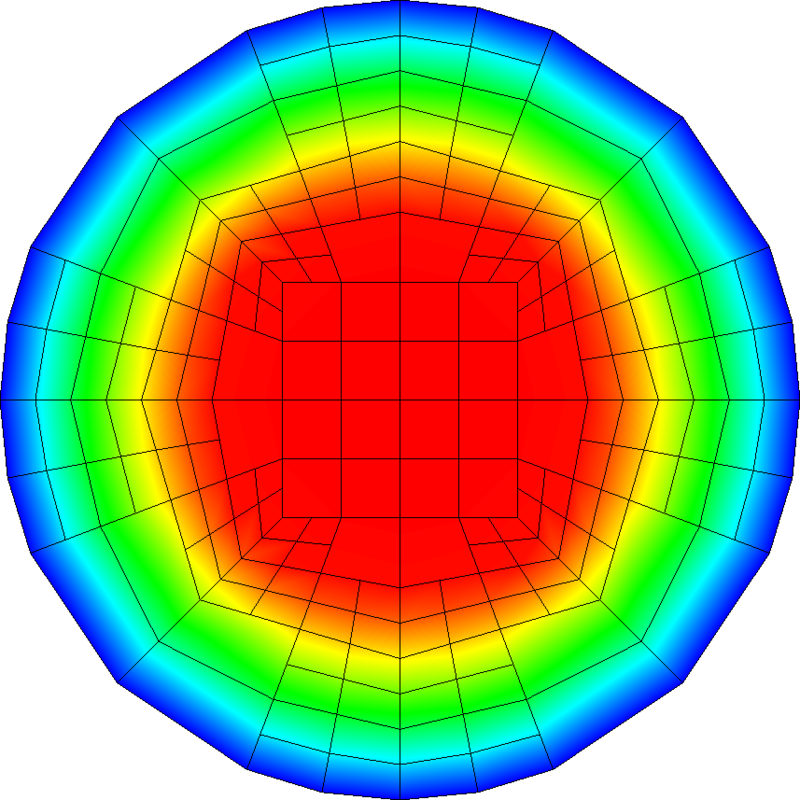 On the other hand, one may want to do something similar for the gradient of a vector-valued displacement field (such as the strain or stress of a displacement field, like those computed in step-8, step-17, step-18, or step-44). In that case, the solution is already vector valued and the stress is a (symmetric) tensor. deal.II does not currently support outputting tensor-valued quantities, but they can of course be output as a collection of scalar-valued components of the tensor. This can be facilitated using the DataPostprocessorTensor class. The documentation of that class contains an example. Definition at line 778 of file data_postprocessor.h. Constructor. Take the name of the single vector variable computed by classes derived from the current one, as well as the update flags necessary to compute this quantity. name The name by which the vector variable computed by this class should be made available in graphical output files. update_flags This has to be a combination of update_values, update_gradients and update_hessians. If the DataPostprocessor is to be used in combination with DataOutFaces, you may also ask for a update of normals via the update_normal_vectors flag. Definition at line 99 of file data_postprocessor.cc. Return the vector of strings describing the names of the computed quantities. Given the purpose of this class, this is a vector with dim entries all equal to the name given to the constructor. Definition at line 110 of file data_postprocessor.cc. This function returns information about how the individual components of output files that consist of more than one data set are to be interpreted. Since the current class is meant to be used for a single vector result variable, the returned value is obviously DataComponentInterpretation::component_is_part repeated dim times. Reimplemented from DataPostprocessor< dim >. Definition at line 119 of file data_postprocessor.cc. Return which data has to be provided to compute the derived quantities. The flags returned here are the ones passed to the constructor of this class. Definition at line 128 of file data_postprocessor.cc. Copies of the two arguments given to the constructor of this class. Definition at line 826 of file data_postprocessor.h.